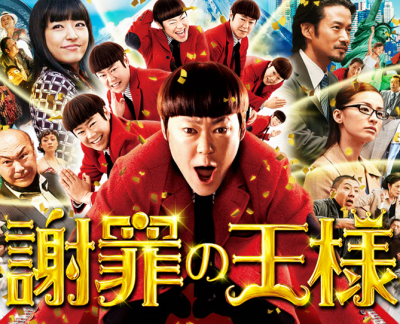 The film up for review today is “Shazai no Ousama,” or “The Apology King.” This is a comedy film, with the tagline, “Anyone can be the hero when they apologize.” The star of this film is Abe Sadawo, who is a comedian known for his loud and flamboyantly colorful style of comedy. Kananan says it was an interesting movie because apologizing is such a common, everyday thing in life, and even though this movie was all about apologies and it was really funny, it also pointed out how important apologies are. This is the part where Kananan gets really deep. It occurred to her after seeing this movie that apologies in Japan are very strange and kind of wrong. Rinapuu is confused. As Kananan explains it, in other cultures, an apology is a recognition that you have done something wrong to someone else and you’re asking for their judgment in the matter, whereas in Japan, because they say it so often, even if they aren’t in the wrong (like if you bump into someone on the train, you would say, “I’m sorry,” but then they would also say, “I’m sorry,” even if they had nothing to do with it), they end up losing the meaning that comes along with it. Obviously, there are very important cultural customs to consider in Japan, like how you say I’m sorry (sumimasen versus gomen nasai versus gomen) but it’s kind of difficult to understand which to use and when to use it, but this movie showed her that sometimes Japanese apologies are made up of only the words and have not actual feeling of remorse behind them. The movie was still funny, but it made her realize that she needs to put more thought into her apologies rather than just going through the motions. She recently felt the importance of this when she received a message from a friend she had had since elementary school, but they had gotten into a fight and hadn’t spoken to each other as friends in years. Her friend sent her a message and apologized and Kananan apologized too and even though it took a long time for them to reconnect, it was worth it because now they were both truly sorry and weren’t mad anymore rather than trying to force things back together sooner. To celebrate her newfound appreciation of putting feelings behind words, they play the next song. The first letter comes from Sekkyoukoala. They want to know if Tsunku intentionally connected their two new songs. Chikyuu, from Chikyuu wa kyou mo ai wo hagukumu, means earth, which in Japanese is pronounced “aasu,” as in Aa Susukino. They were thinking about this and wanted to know if they knew if it was intentional. 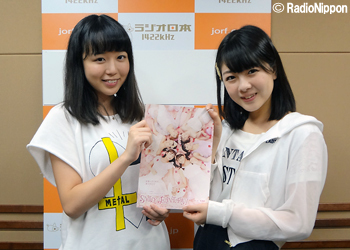 Kananan says that she also noticed this at some of their release events and wanted to ask him about it. However, she really doesn’t ever see him so she doesn’t know how she’d be able to ask. Maybe she’ll write him a letter. The next letter is from Takeuchi. They’re looking for some advice since it’s getting cold at night. Their dog always sleeps in bed with them, but whenever it leaves the room it leaves the door open and it gets really cold. They want to know if they have any ideas on how to solve this problem. Kananan: The dog can open the door! Isn’t that just incredible? Rinapuu: It’s not that kind of door. After crushing Kananan’s dreams of a dog being able to open a door (although I personally did once have a cat that could open my bedroom door, which was somewhat terrifying), Rinapuu explains the situation again and they try to think of how to let the dog sleep in the room while still being able to leave without making the room super cold by the morning. Kananan: Well, I’m sure if you just talk to him, he’ll understand. Just like, “Hey, close the door!” And he’ll be like yeah. Rinapuu: The dog will say “Yeah”? Kananan: I mean no, he’ll say ruff! Ruff ruff! Rrrruff!!! The third letter comes from Beriimakoreeji. They want them both to take care of themselves as they’re certain they’re busy with the play and release events. They also wanted to ask Rinapuu about what she said earlier about Kanana and her looking like twins to strangers and want to know how they see each other and if they think they look like twins. They look forward to the play. “Sent from my iPhone.” After laughing over Kananan’s bizarre reading voice and creative decision to include the information about the iPhone, Rinapuu says that she can see why people would think the two of them are twins, but she thinks they look like ordinary sisters instead. Kananan also laughs because Rinapuu does actually have an older sister but she gets along better with Kananan like a sister would. For example, if they go out somewhere together, they can communicate a lot to each other without saying anything, which Rinapuu cannot do with her sister. They have telepathy, Kana thinks. “Our names are even similar, Rina and Kana,” she says, “I think we just might be related!” They don’t have this relationship with the other members, either, so maybe they really were separated at birth. Hard to say. So that’s all for this week. “Kanalove,” says Rinapuu. I agree. 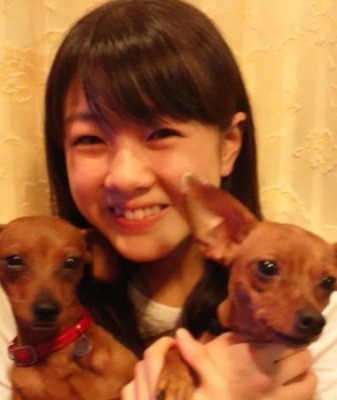 Are those dogs on the picture ruru and chocola? Looks like them to me.